the one about my creepy cat. It has come to my attention that several of you are creeped out by one of my cats. It also has come to my attention that I may very well be a crazy cat lady in a normal lady body because I am thoroughly convinced that not only are my cats perfect, they are pretty much the coolest cats to ever walk this delightful planet we all share. It is also fairly obvious that I am tipping the crazy cat lady scales with the sheer number of photos I’ve taken of these two cats in less than a week. But back to my cat making you uncomfortable. A third of you are bothered by his one eye, another third is bothered by his extra toes and the other third of you are equally squicked by both. For those of you who are on the fence about which one is stranger? I took him to the vet today only to discover that he has extra toes in the back too. The vet called them nubbin toes. As if 18 toes could ever be enough for my cat, he had to go and grow 5 or 6 extra. To be fair Cody thought the one eye thing was a bit much in the beginning, especially when Wink rubbed his eye hole on Cody’s hand his first day home. You know what I think is creepy? But no one ever tells me how creepy my face is because I am a human with feelings who can read and most of you are kind human beings who understand how hard it would be to have a giant crazy rash on your face so you don’t say anything about how weird it looks. I thank you for that, but I assure you, I’m well aware of how strange I look. This cat had to have surgery again because it was believed that no one could look past his scarred eye, because he would be seen as ugly. He spent four months at the shelter. When I went in to see him the first time he said hello and then walked away. I can only assume he was used to being looked over and ignored. To all of you who ignored him? You missed out on one of the greatest cats ever created. This cat wouldn’t have been at the shelter more than a few weeks had he had both eyes. He is the sweetest, kindest most chill cat there is. Your loss. Maybe it’s because I know his story that I have such a soft spot for him, which is why I ask everyone to give everyone else around them the benefit of the doubt. Yes, my cat looks different and some people have had no problem saying unkind things about his appearance because he is a cat and some people believe cats don’t have feelings. Yep, and it’s pretty much the best job there ever was. Oh, my gosh – Addie’s comment just reduced me to tears. She is too sweet. I have no doubt that she will love him more than enough for everyone who missed out. @@JustHeather, That kid, she’s a keeper. That is some wicked cool, perceptive, empathetic, amazing kid you got there. I’m assuming the wee one will follow in her lovely footsteps. Also? You’re face is not at ALL creepy. So wherever you got that idea – it can be replaced with a truth now, since it’s a lie. Do that. Love, The Best Dry Mormon That Ever Walked Into Trader Joes. @Karen Sugarpants, And Monkey Joe’s, and Joe’s Crab Shack and Joendiana. I love your cats! They look cuddle-worthy. And petting-worthy. And share the bed-worthy. But, I also love my obese, grouchy cat with multiple personalities who has psychologically damaged dozens of children. So technically my good opinion is not exactly a stellar endorsement. I’m just another crazy cat lady. Oh and when I look at your face, you know what I see? One of the most beautiful people I know. @Ami, Right back ‘atcha crazy cat lady. @CaySedai, The way I look at it, it’s more privacy from their prying eyes. I love this. Thank you. From one crazy cat lady to another. I will say, it’s quite shocking to see a cat with extra toes and no eyes, but after about 5 seconds, the shock wears off… Look at those markings! And my gosh, does he look soft. @Rebecca, He’s SO soft. And Addie says he smells like a lady…so there’s that. We had a red tabby with only one eye and he was amazing. When he was still a kitten our neighbor shot him in the face with a rifle. It destroyed his eye, but God protected him. There was no bone or brain damage, though I’m sure he could have easily lost his whole head. The eye was removed and his eyelid sewed shut. It was a hard recovery, but through that recovery he bonded hard with us. He was the baddest cat in the neighborhood – scrapped with all kinds of critters (raccoons, dogs, etc.) and won – but he was always gentle and cuddly with us. My parents had to put him down three years ago. They have two more cats and I have one, but that amazing cat is still the one my heart belongs to. @AG, Whoa, kitties shouldn’t be shot in the face, he must have been a special one! @Liz, Wink winks in admiration of your compliments. We have one cat who is deaf, and another who is hairless. We are the home of the hearless and hairless. The deaf one meows like a pea**** (VERY loudly), b/c he has no idea what its supposed to sound like, and you have to make sure there are enough blankets around for the hairless one, b/c she gets too cold. They are the sweetest cats you’ve ever met, and yet, I’m constantly defending them against people who think they’re “weird”. Drives me crazy…no one would say those things if there were my actual human kids. I think Wink was at the shelter for four months b/c he was waiting for you and your family to find him, he’s lucky to have you! @Kate, Heh, so my swear word filter edited pea****. Which is hysterical. I will admit that hairless rats are a bit much for me, but cats? Bring it. This gave me the giggles. Your cats are beautiful – I have a rescue, too. I’ve never commented before but I love your sense of humor, your beautiful pictures, and the kind spirit of your family. @Jenn, Oh thank you. There should be a sisterhood of animal rescuers. Cody can even be in it with us. 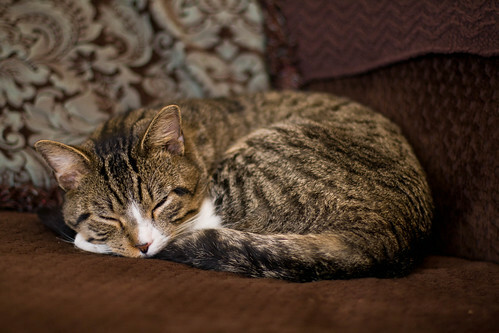 Maybe it’s because Wink (seriously love his name) resembles our cat so very much…in appearance and in temperment, but I think he’s just adorable! I think it’s wonderful that you are giving him a loving home and all the cuddles he’s been deprived of. I wish I could send you a photo of our cat, Cooper. He looks so much like Wink that my kids thought it was him when I showed them your photo! I also think he could compete with him in the best.cat.ever. comptetition, but it’d probably be a tie. Mind you, I used to love cats when I was little, then I grew up a bit and simply tolerated them. Now, because of this cat, and how WONDERFUL he is with my kiddos, I love them all over again. So, I totally get why you love Wink so much and I really appreciate that you took a chance of loving him, no matter what “imperfections” he may have. Heck, I’d even venture to say that you got the best, most unique cat in the litter…not everyone can say their cats can give them two thumbs up!!! Happy cuddling! @Beth, TWO THUMBS UP! I LOVE IT! Once again I am reminded how cruel people can be. Seriously, your cats are amazing! I love the one eye, multi-toed Wink and would cuddle him to death if I wasn’t deathly allergic and the multi-toes only add to his coolness! My sister had a one-eyed cat, Petey Cyclops, who lost his eye in an unfortunate bird incident. He was the best cat ever! Rock on with your Crazy Cat Lady self! Also, both of my children have things that make them special and unique (birth defects) and we have always taught them to never say anything negative about another person. God made all of us special and unique. We all have imperfections, some are just more visible than others. Pointing them out and making fun just shows how small and shallow that person is. P.S. Your face is amazing, don’t let anyone tell you otherwise! @Lisa, While it’s not quite the same, convincing Addie that her curly hair is really a blessing to be excited about, I fight similar battles of embracing your unique up in here too. P.S. I agree that Addie is the most adorable, sweet, kind-hearted, loving child. I love the comment she made about Wink…melted my heart! And…you’re beautiful…don’t tell yourself otherwise! I understand that it’s hard not to…I have more acne now as an adult and it drives me crazy because its ON MY FACE! So, I relate. But truth is, you are fabulous, inside & out. Seriously…no one even notices your skin because they are too busy looking at your gorgeous eyes. I love Wink. As the owner of a dog with a honking scar down his back leg (what happened to HIM? is the question at the dog park) and a mutated half toe with a curly cue nail, I understand. When we adopted him he was one of 10 beagles and he was the least “beagle” looking and I just had to take him home to love on him. @Daisy, Honking scar…heh. I have a soft spot of beagles as well, it was the dog my step mom had when my dad married her. Strange little lovable dog. I’m an always-reader, sometimes-commenter. Just wanted to say I am a huge cat lover, and I love this guy too! His extra toes are awesome – I think it’s the Ernest Hemingway cats on Key West that also have extra toes. Great post! @Stephanie, It is the Hemingway cats! So basically knocking my cat is knocking the great American author, and no one wants to do that. Creeped out by darling Wink???? Never. I’m having a hard time not coming over and stalking you just to get a snuggle with him. @Amy, Percy’s kind of an attention whore so you’d have to stick around for awhile. awwwww…poor kitty. Nubbins!I like his mittens. And I about laughed coffee out of my nostril again at the cat rubbing his eye hole on your husband! i love you…so funny. And you have a good heart. I like the photos. @Jessica V., Thank you, I’ll admit, I haven’t gone near the eye hole *just* yet. I’ve know cats with extra toes…and I’ve know cats without legs…and I’ve known cats without eyes…wait, no I can only now add that to my list. If I wasn’t so disgustingly allergic I would have several cats in my house now. I would love to have rescued cats like the ones your big heart took in. I’m so glad that Wink found such a warm and loving him…the reason everyone else looked him over is because he was meant to find you. @Sarah, You’re the crazy cat lady crippled by allergies. And I’m glad I got him. @Tina, I got him a tiny little pirate hat for Halloween. But I decided to give him at least a week before I started dressing him up…the week is up today. I’m totally not a cat person, but you, well, kind of make me want to go get one now…. I worked & volunteered at a shelter last year while I was pregnant and have long been a crazy cat lady in the making (we have five inside, one outside plus the strays I feed) and this post? Just thank you. Thank you for adopting adult cats. Thank you for adopting special needs cats. Thank you for seeing their potential and loving them regardless of their challenges and complications. And thankyouthankyouthankyou for advocating for them when others don’t understand it like you and I do. This made me cry in the best of ways. Thank you and your family, so much. @Tabatha, Oh no, thank you. I’ll be a tiny old gramma volunteering in the shelter to sit and pet the cats. I don’t find him creepy at all. I want to snuggle him. But I’m like Addie, I’ll take the Charlie Brown Christmas tree and the one eyed cat any day! @Stephanie @ dialmforminky, I want that Christmas tree so bad. 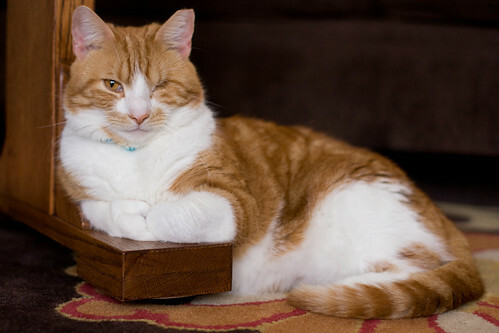 Wink had me at the extra toes; the pirate-eye is just the icing on the cake. I love ‘em all. @Roberta, Wink has a twee little pirate hat, I shall unveil it when the world is ready. I’ll never understand why people think it’s okay to physically or verbally abuse animals, simply because they don’t a voice of their own. Obviously your readers aren’t being abusive in this case, but hurtful nonetheless. I think your cats are adorable and fuzzy and I’d be happy to snuggle with either one of them! It breaks my heart that such a sweet guy was passed up because he did not appear “normal”. He is so blessed to have found his home, the home that was meant to be with his new buddy and your family. When we considered getting a second dog, we went to a shelter and they had this beautiful pit who was so sweet and just a personality except he lost the use of his back legs. How, he defended his owner from an intruder with a gun and was shot. His owner had to give him up because of the expenses. I wanted that dog, but within wheelchair and our stairs it was not an option. The people at the shelter told us they don’t think he would be adopted but they are thrilled because he is their dog and they will love and take care of him as long as they can. That dog is so sweet and amazing. I wish we could have given him a home but, he is loved. @Christina, He’s a hero dog! I’m happy to hear he’s loved and that you were so willing to love him first. I fully believe that, like children, pets pick their families. My two cats drive me insane on a daily basis, but I love them so much and could not imagine having having two more perfect cats. Your cats are lovely and I’m glad to see we’ve added a new member to the crazy cat lady club! @Jessica, Percy picked us when he crawled into Vivi’s stroller with her at the shelter. I’m a regular reader, never commenter, but I love Mr. Wink! And you have made me think about finding a cat that others may have passed over the next time. @Nancy, Oh you totally should, rescue pets know who the good humans are. There is NO such thing as an ugly cat! 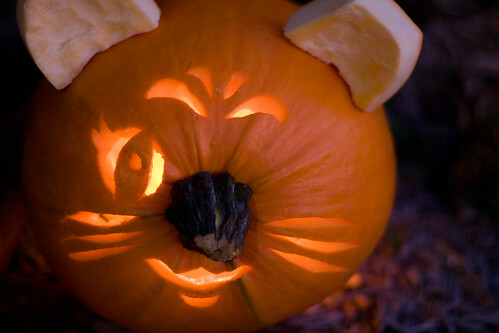 (Said the crazy cat lady with three cats who loves all cats everywhere) I think he’s adorable – kinda like a pirate. And the extra toes? I think it’s cool. I want to come over and rub his feet! @Kassandra, HE HAS A TWEE LITTLE PIRATE HAT! And yes, I rub his toes a lot, they’re just so substantial. I’m creeped out by people who could be so mean! Both of your new housemates are lovely and wonderful and so are you for rescuing them. @Brittany, They’re obviously dog people. As the owner of a “Hemmingway” cat, and as a veterinarian who sees lots of 1 eyed, 3 legged, or other “abnormal” animals, I applaud you for adopting one. You are right. People sometimes can’t handle what is different, but it is the people that can that really appreciate true beauty, and can see a beautiful cat with a lovely soul that are the lucky ones. He and his adopted brother are so blessed to have found their forever home with your family. Congratulations! @Kelly, Hemingway totally knew what was up. I think he’s adorable. Seriously they both are. They make me want a cat and I’m highly allergic. @Issa, That’s the best cat compliment there is. Randomly, I will never understand why people are freaked out by different. Different isn’t bad. My grandparents have a one-eyed kitty. She accidentally got in the dogs bowl at dinner time when she was tiny, and the doggy accidentally chomped her eye. She is beautiful and cuddly and perfect! @Meg, We need badges or something. Shaped like mice and that smell of ‘nip. Your cat is special not weird. Also, I sniffled about Addie’s statment on the cat. she is right. @charlene, that kid, she’s a good egg. I’m a crazy cat lady for sure. I have five. My newest adoptee was from a horrific hoarding case. She has only one (beautiful) eye and one kidney, because of the horrific abuse and neglect she and all of those cats endured. She is awesome and absolutely beautiful to me. Her empty socket doesn’t close, it’s just open, which totally freaks people out. I love it. @dysfunctional mom, I’m not so sure Cody could have done just a socket. But you know I would have made him. Wink is beautiful and you hit the jack pot! breaks my heart someone would say anything unkind. Cats are a blessing! @Robin, And Dysons are a blessing to cat owners. Yet another crazy cat lady here (my allergic-to-cats-but-still-loves-them-dearly husband’s rule is no more pets than adults in the house or else I’d probably go adopt the entire shelter). It makes me sad that people are saying mean things about your cute kitty. Their loss, I suppose. It also makes me sad that you think people are thinking mean thoughts about your face. They’re not. I pretty much guarantee it. They’re staring at your pretty eyes and wondering what magic mascara you use. I promise. And I promise I have never noticed the rash that you think is so obvious. You’re beautiful regardless. Thought I’d go on record and say that I find that one eye and the extra toes to be AWESOME. Love is love, no matter if it’s ugly! @Tricia, He won’t get lost for long, that’s for sure, he’s too unique. @Brooke Randolph, Isn’t she wonderful? I’ll keep her. I have a long habit of choosing the “weird” cats that no one else wants. Have you read the book about the blind cat, “Homer’s Odyssey” by Gwen Cooper? 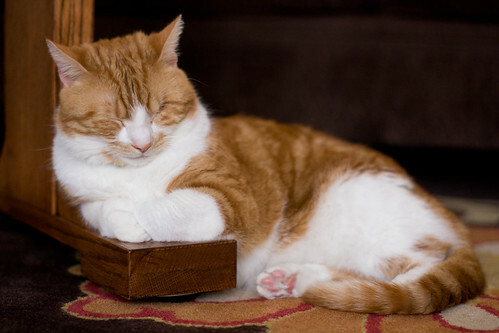 These cats are so inspirational, because they show us that what we think of as a disability is actually a superpower. I’ve always thought polydactyl cats were awesome. Two eyes, one eye, or none at all? Cats are beautiful no matter what. Bless you for taking these gorgeous guys into your house, heart, and family. Your daughter obviously has picked up her mom’s compassion and empathy. @Jessica, I read the one about the two legged dog, I’ll have to add the blind cat to my list! By the way, you are lovely. Honestly. @Ashley, That was a lovely post. I nodded through the whole thing. Aw, I didn’t even know you had one cat! What’s her name? Also, whoever said Wink is creepy has issues of their own. He’s gorgeous! He is definitely one of the most handsome cats I’ve seen. And hey, his extra toes make up for his only having one eye, people. It almost physically hurts me when people give up their pets because of aesthetic features or aesthetically alter their pets to make them “cuter” (people who have their corgis’ tails lopped off, I’m looking at YOU). PS: Your face is not creepy. It’s blotchy, yes, and it probably really pisses you off, but you’re still hot. Seriously. @Liz, Heh, someone commented earlier about their deaf cat who isn’t sure how loud they’re supposed to meow so they just howl like waterfowl. Hahahaha. Mine would like us to think he’s deaf, but he has selective hearing. Your face is certainly not creepy!! LOL. And Wink’s special features just make him that much more loveable! I used to volunteer at a humane society, specifically with kittens and it is a wonder I didn’t come home each day with a new blind or somehow “less that perfect” friend! @Beth, I have been holding onto these kitties for extra long stretches now that it’s getting cold. @Casey, That is awesome! It’s not that cold, but rainy here and I have lucked into a cuddly pup this afternoon. Still not the same though! This post is why I’d like to one day meet you and hug you and I don’t even really like cats. I guess it’s just the soft spot I have for all the lost but good souls in the world who need a champion and you doing just that for Wink. @Cute~Ella, I had a nightmare about Wink last night, he was sick and I was ready to spend and do everything and anything to make him better. Still messing with me today, even as he’s right over there snoring and healthy.